With the new Mac Pro in the hands of reviewers for more than a day now, the first impressions focused on performance are being published and they are impressive. FCP.co posted a 24-hour hands on with the new Mac Pro. They found read speeds of 880MB/s from the Mac Pro's solid state storage, with impressive write numbers of 985.5MB/s. Further, the team discovered that new machine could post full 4K video with multiple color corrections, effects and transitions playing back all in real time. Macworld saw even more impressive SSD performance, with Black Magic reporting 952.8MB/s writes and 920.5MB/s reads. Black Magic's speed test app reports that the new Mac Pro can easily handle all video formats it currently tracks, with FCP.co adding that its Mac Pro was able to play back 16 simultaneous streams of 4K video. I can quite honestly say that, despite working with these huge file sizes and frame sizes, the editing experience has been silky smooth. Skimming, playback, shuttling, jogging and trimming are all responsive. In fact, editing 4K on the Mac Pro feels like editing HD on my current MacBook Pro - except I can see large numbers for the frame sizes where normally I’d expect to see the reassuringly familiar "1920x1080". They went on to push the machine by adding real-time effects to a 4K stream to see the breaking point. And so it went on… Multiple colour corrections, effects, transitions. This thing keeps playing back! In fact at one point I took a RED RAW 4K clip into a 4K project and just started working through the list of video effects (many of which are 4K ready). Watch the result for yourself. Back in September, GeekBench scores for the new 8-core 3.0Ghz Mac Pro appeared, giving the unit a single- and multi-core scores of 3349 and 24429. Now, on production hardware, Macworld got scores of 3599 and 25997, a modest improvement. Both Macworld and FCP.co mentioned a gentle but notable current of warm air rising from the machine, but that the Mac Pro's fan was barely noticeable. If something is placed on top of the machine's vent hole, like a book, the Mac Pro will shut itself off before any damage can occur. 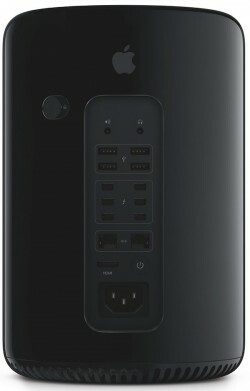 The new Mac Pro is available for order now, but shipments are not expected until well into the new year. An Apple spokesperson said yesterday that "demand for the all new Mac Pro is great and it will take time before supply catches up with demand". I have absolutely no use for the new Mac Pro, but dammit, I want one. Apple has clearly abandoned the professional market! Explain to me what separates your "real" editing from the pros that happen to use a different program that the one you prefer? Impressive. It really is a neato machine, but unfortunately the lack of expandability in the long tern ruins it for me. But I wouldn't say no if someone were to buy it me. I could use it as an ashtray too. Man these comments keep getting more and more original. How do you all think of such novel things to say? You look that up on the Internet? There's nothing you can do on this Mac Pro that you can't do on a 14th generation iPad Air. But Apple won't release the 14th generation iPad Air, because they want to sucker the pros into buying this now. Third parties demonstrate mind numbing FCPX speed, so obviously FCPX is completely irrelevant.